Sharjah: Moatassem Yassin struck with one minute remaining to help leaders Sharjah overcome jitters for a hard-fought 2-1 win against visiting Al Dhafra and keep their top position intact after 14th round action of the Arabian Gulf League (AGL) on Tuesday. Trailing on a sixth minute strike from on-loan Abdullah Esmail Al Refaey, the home team finally found an equaliser when Igor Coronado drew the league leaders on level terms in the 78th minute and then Yaseen got the match-winner with just a minute remaining. 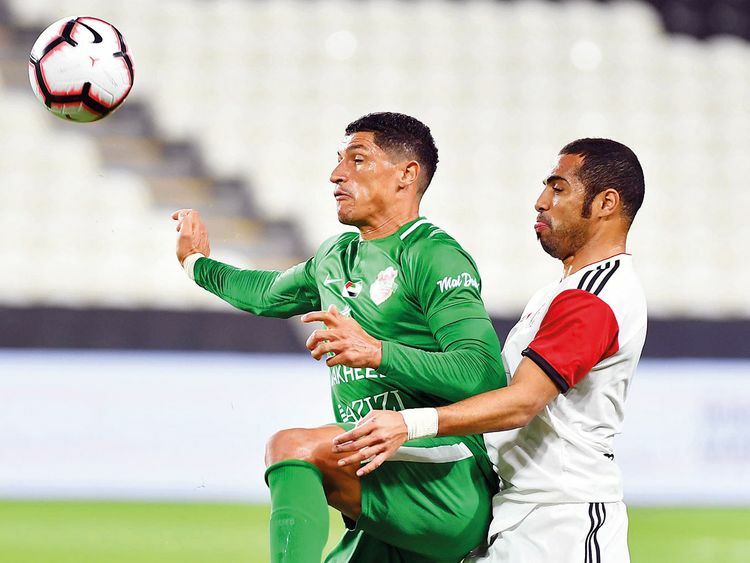 With Al Ain scheduled to play at home to struggling Emirates Club, Sharjah can stay content that the defending champions will not be able to replace them at the top. With Al Jazira slipping to a solitary-goal loss against visiting Shabab Al Ahli Dubai late on Monday, the early results of Tuesday ensured that Sharjah stayed on top with 34 points and even a win against Emirates later on Tuesday will see Al Ain crawl their way up into second with 31 points. After soaking in the early pressure, the home team went down when Egypt’s Al Refaey — currently on loan with Al Dhafra from fellow Abu Dhabi club Al Wahda — received a crisp pass from Diego Rigonato and placed past Adel Al Hossani on the Sharjah goal in the sixth minute. Sharjah pressed for a goal through much of the second half, but the visiting defence line remained stubborn and goalkeeper Khalid Saif Al Sennani denied Otabek Shukurov (70th minute) and Wellinton Morais (73rd), But the home team finally found an equaliser in the 78th when Coronado’s try found the far corner of the Al Dhafra net. The home team continued pressing and got the match-winner through Yassin’s solo strike. In the second early match of the day, Al Wahda scored all their goals in the first half and then withstood a fightstood a fightback in the second for a comfortable 4-2 away win at Kalba. Leonardo de Souza opened on the 17th minute and Sebastian Tagliabue doubled five minutes later. Sultan Al Ghafri made it 3-0 in the 32nd, while Mourad Batna ensured a comfortable margin of 4-0 in the 38th minute. Al Wahda then played possession for much of the second half and nearly paid the price when Myke Ramos scored two goals — the first in the 72nd and the second in the 85th to show signs of a fightback. The result ensured Al Wahda retain their fifth position with 21 points ahead of Bani Yas — who had run away with a 4-0 win against Fujairah on Monday.